Thank you for your interest in our ministry. Below you will find the links to download your copy of our available books. Please be sure to bookmark this page to assure future access. Get a copy of all three of these powerful books and SAVE BIG! All Three for only a $19.95 donation! Click here to download your FREE copy of "The Great Escape". If you love Jesus, you care for those He died in such awful agony to save! You can't stand the idea that your loved ones might miss heaven and spend eternity in hell. Or anyone else for that matter... But you haven't known what to do about it. Here's your answer! We can place in your hands a marvelous new tool to lead them to Christ. It's the book, The Great Escape. 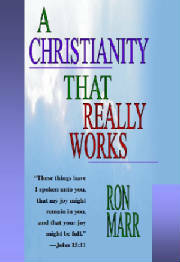 Click here to download your FREE copy of "A Christianity That Really Works". Do you long to reach God's heart but rarely seem to get as close to Him as you would like? There is a way to succeed in the Christian life! Ron Marr offers hope and encouragement to every believer who is looking for continuous personal revival in his or her life. This book is practical and applicable to life right now. 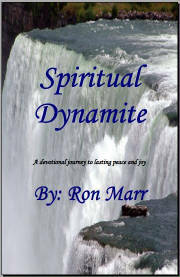 Click here to download your FREE copy of "Spiritual Dynamite". Just to be willing, by God’s enabling, to worship the Lord and rest in Him whatever the circumstances He is permitting at the moment - that's spiritual dynamite!